Ewan McGregor stars in Disney's live-action Winnie the Pooh revival. Perfectly threadbare in its by-the-numbers execution, the new live-action film Christopher Robin delivers one fresh realization: There’s only one A.A. Milne. This movie, by comparison passed through the creative hands of at least five individuals in its writing phase. The result is a story that’s a lot like Spielberg’s Hook, itself a film that doesn’t quite work. Unfortunately, no lessons from that movie were applied in the making of this one. A speculative bit of fluff about the now-adult title character (Ewan McGregor) as an overly busy parent and professional who‘s forgotten his childhood playmates from the Hundred Acre Wood, Christopher Robin is as well rendered as it is utterly boring. It surely helps to arrive at this with some emotional affinity for Winnie the Pooh in some incarnation, be it the original books or the Disney animated adaptations. Both aren’t just referenced throughout, they are the shamelessly nostalgic fuel that keeps this thing running. All the best lines are appropriated from Milne; all the best music is derived from the Sherman Brothers memorable classic tunes. Everything else hails from a standard-issue postwar British cookie-cutter mold. And the Brits aren’t exactly known for their cookies. 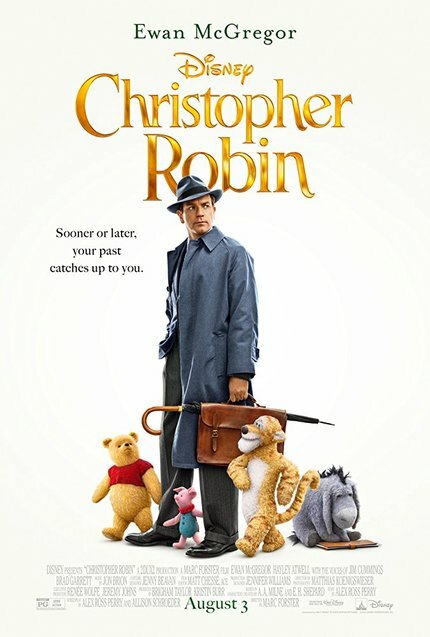 Though Christopher Robin presents as a lovingly-gestating end-of-summer blockbuster, complete with iconic characters, famous faces, a prestige director (Marc Forster; The Kite Runner, Stranger Than Fiction), a large scale, and top-notch visual effects, the truth of it is that’s its more of a rarely humble Disney offering, aka the David Lowery’s 2016 Pete’s Dragon remake. Except, unlike that film, this one doesn’t realize that about itself. Everyone onscreen is just fine; most of them capable of convincingly sleepwalking through roles like these, but graciously opting not to go that route. McGregor carries the film, personifying the universally recognized “Cat’s in the Cradle” father in the form of a British Upper Class Twit (trademark, Monty Python). Actually, it’s the upper class twits that he directly answers to, being an executive at a struggling luggage manufacturing company. Tasked with formulating a twenty percent budget cut on extremely short notice, his childhood friend Pooh (voiced once again by Jim Cummings) decides to wander back into his life. From here, Robin check-boxes all the expected character reactions, in order: Shock, displeasure, refusal, et cetra, before finally acquiescing, warming, being rejuvenated, and awakened to betterment. (Spoiler alert there for anyone who’s never seen a movie). Before the end, all the classic residents of the Wood are back in play, making by for a complete, if also cluttered character list. McGregor is capable of far more than what this film gives him, but he sells the tired schmaltz as best as anyone can. Hayley Atwell is Robin’s neglected wife, and Bronte Carmichael is his neglected young daughter, Madeline. Atwell is given tragically little to do beyond chase after Madeline late in the film when she is caught up in a Toy Story-style chase. Carmichael is the sad cherub the story needs her to be, communicating that her life is a desolate void because her dad is so busy all the time. (In a movie called “Christopher Robin”, you’d better believe that everything everyone else thinks, does, or says, is intrinsically focused on Christopher Robin). Forester, more known for his Oscar- bait films that prove too be either hard-edged or to mushy soft to win (Monster’s Ball, Finding Neverland, respectively), and a James Bond movie (Quantum of Solace) was and World War Z, directs this with a completely sure hand. Much surer, in fact than his work on said James Bond film, or 2011’s at-odds-with-itself Machine Gun Preacher. But his knowing where to put the camera, when to cut, or what to have an actor do, cannot save Christopher Robin from its own derivative fullness. Among the many, many talents gainfully employed by the endeavor, its character animators had the biggest job, and should be allowed to shine the brightest. The realization of Pooh, most importantly, is a bit of a triumph. With only a brow and black beaded eyes, a range of emotions come through; his shifts in expression utterly imperceptible. The kid gloves with which Pooh is handled means his presence is not some sort of reimagined atrocity. It would wholly defeat his purpose as a symbolic motivational plot device if it did. Christopher Robin’s proof of having been creatively passed around is right there in its distilled nature. Despite the writing credits of such luminaries as Alex Ross Perry (Listen Up Philip), Tom McCarthy (Spotlight), Allison Schroeder (Hidden Figures), and Mark Steven Johnson (2003’s Daredevil), exactly none managed to leave any fingerprints. Apparently, creatively speaking, they took the film’s central pandering message about the virtues of kicking back and doing nothing to heart. Christopher Robin makes its way out the woods just as vacation season is winding down, giving it a unique opportunity to preach to a tanned and well-rested choir. Robin also manages to work in a last-minute proletariat denouement about bottom-up economics, just for good measure. Because, saving Mr. Robin isn’t enough, he also needs to save the world. And a plushy, lazy, oh-so-delightfully innocuous, saturated world it is. Some folks can have an "A" for effort, but this is no A.A. effort.